Using Themes in ActivePresenter 7 - Atomi Systems, Inc. Most users may have heard that ActivePresenter 7 now supports themes. In this tutorial, I’ll show you details about using themes in ActivePresenter 7. When working with ActivePresenter 7, using themes helps create a consistent visual design for the whole project. In a word, a theme is a predefined combination of design components: Theme Colors, Theme Fonts, Preset Background Styles, and Slide Master. Theme Colors are a set of colors. In the Theme Colors, the first four colors represent text and background colors (light and dark for each). The remaining colors illustrate six accent colors for objects. Besides, ActivePresenter automatically creates shades and tints. You can’t control how they are defined. Theme Fonts are a set of fonts that is meant for heading and body text. Each theme font has a font for heading and a font for body. Preset Background Styles come with each theme. 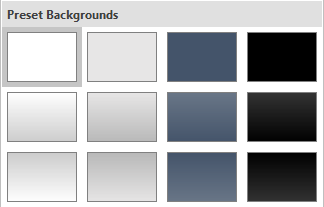 Using preset backgrounds, you can change the slide background for the whole project quickly. Slide Masters give a uniform appearance for your presentation. Each theme contains a slide master and a related set of layouts. Different themes use different slide layouts. ActivePresenter 7 provides a lot of themes which appear in the theme gallery. The app offers you two ways to use theme. First, create a new theme-based project. Perform this task by going to the Start Page. For more details, see Creating New Blank Projects. Second, change the theme of the whole project or some slides to new them. Regarding this technique, there are four major tasks as shown below. To access the theme gallery, go to the Design tab. 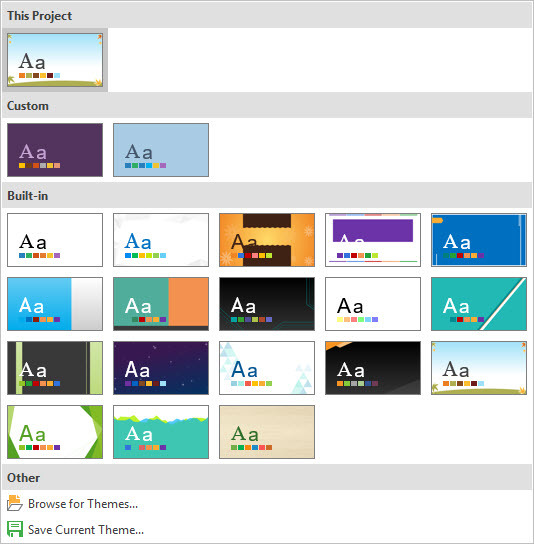 As shown below, this gallery shows thumbnail previews of themes. The theme currently applied to select slides will be displayed with a gray outline. You can hover the mouse over each thumbnail to see how a theme will change the appearance of your project once applied. The theme assigned to the current slide appears in the This Project section. Meanwhile, the Custom section contains all themes you’ve created (called custom themes). The third section is where to show built-in themes which come with ActivePresenter 7. Note: By default, ActivePresenter applies the plain theme (call Blank theme) to a new blank project. If you don’t like it, just change to a different theme. To apply a theme, just select a slide, and then click any theme thumbnail. This way, the theme is applied to all slides that use the same Slide Master as the selected slide. Slides based on other Slide Masters remain unchanged. It’s as simple as that! But the great thing is that ActivePresenter 7 gives you more options. To see them, right-click any theme thumbnail. Apply to Matching Slides: This option works the same way as when you click the theme thumbnail. Apply to Selected Slides: This applies the theme to selected slides only. The option is practical when your need is use different themes for different slides. Apply to All Slides: This changes the theme of all slides in your working project to new theme. Delete…: This option is available only for custom themes, not supported for built-in themes and any themes currently used in your project. Select it to remove the theme from ActivePresenter. By doing so, that theme no longer appears in the theme gallery. Set as Default Theme: This lets you set a theme as default for new projects. After that, whenever you start a new project, it will use that default theme. Copy those files to C:\Users\\Documents\ActivePresenter Templates. Then, restart the app, and you will see your themes appear in the theme gallery. Click Browse for Themes… and look for a theme file in your file system. Modify the Preset Background Style. Add or customize items on Slide Master. To save the current them for use in other projects, select Save Current Theme… from the bottom of the theme gallery. Then, choose a name for your theme and click Save. Let’s rock and roll. Download ActivePresenter 7 right now and create your first project using themes. If you have any problem, don’t hesitate to contact us.